The cartoonist, seen here, with one of his adoring fans. Chad was born at an early age. Abandoned by his parents on his 20th birthday, he was forced to wander aimlessly in his neighbors backyard. It was there that he was adopted by a pack of friendly ground squirrels and taught the ways of small rodents. Subsisting mainly on grass, seeds and insects, Chad grew and grew, Until one day, the neighbor finally got sick of the huge holes Chad was digging in his rose garden and had him leave the state. Thus in 1988, Chad moved from his home in Alaska to Sarasota, Florida where he had the nice opportunity to learn some of the cartooning tricks of the trade from "Hagar the Horrible" creator Dik Browne. While in Sarasota, Chad also got to know another cartoonist that lived in the area. That cartoonist was Mike Peters, the creator of "Mother Goose & Grimm". It was Peters who set Chad on his current project of "Tundra" by telling him to "draw what you know." Having grown up throughout the state of Alaska, Chad decided that "what he knew" was animals & nature. Because of this Chad decided to head back to his home state. Once there, Chad began the awesome task of beating "Tundra" into the psyche of every man, woman, child and houseplant that roamed the four corners of the globe. From these humble beginnings, Chad has turned his artwork into a thriving comic strip known as Tundra which now runs in almost 650 newspapers throughout the U.S., Canada, Europe and even Jamaica & Trinidad. 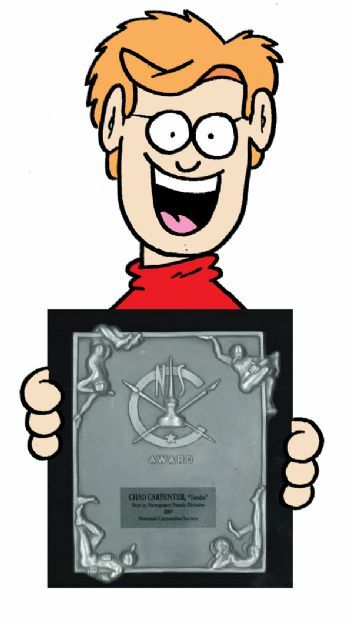 In May of 2008 Chad was presented with the Reuben Award for "Best Newspaper Panel" by the National Cartoonist Society. Tundra has become the most successful self-syndicated newspaper comic in history. The Tundra Empire has grown to include 26 different books, many years of calendars dozens of shirt designs, many different note cards, mouse pads, bumper stickers, an interactive CD-ROM and a whole lot of other TUNDRA paraphernalia. On May 24 of 2008 the National Cartoonists Society awarded the REUBEN AWARD (The "Oscars" of the comic strip world) to TUNDRA for "Best in Newspaper Panels Division"!